Entrepreneurs and business owners would once again enjoy the convenience of Taguig’s Business One –Stop Shop (BOSS) program. 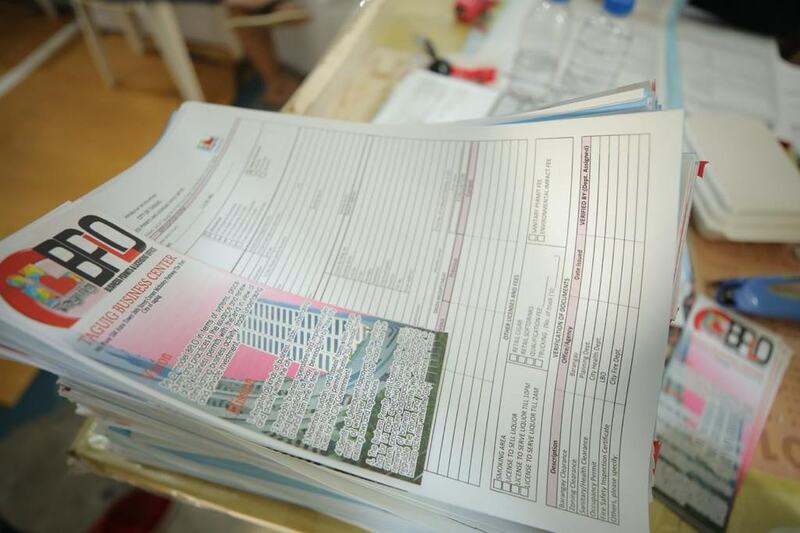 From January 3 to 20, 2019, without weekend breaks, Taguig rolls out its BOSS program which allows for renewal of business licenses and registrations clustered in one place. For added convenience, business owners have the option of two venues, either at the Taguig City Hall Auditorium or the Kalayaan Hall and People’s Hall in its Satellite Office in SM Aura Tower which would be open from 8 am. to 5 pm. BOSS is one way Taguig showcases its business-friendly culture. While the program already allows faster processing of business permits and licenses, the City further intends to make the process comfortable and memorable for business representatives who are treated to candies, biscuits and refreshments during the wait. Tokens like personalized umbrellas and clocks also await the first 100 attendees. “Taxes are the lifeblood of the city’s programs and social services,” Business Permit and Licensing Office officer-in-charge Atty. Fanella Joy Panga-Cruz explained. She also highlighted that taxes translate to social services that include the door-to-door delivery of medicines and scholarship assistance, among others. “The more taxes we collect from the business community, the more we can provide services to Taguigeños,” she said. Because of its efficient services and compliance to Republic Act No. 11032, also known as the “Ease of Doing Business and Efficient Government Service Delivery Act of 2018,” Taguig City collected P2 billion through its BOSS 2018. “Transparency plays a vital role in our city’s successful conduct of BOSS. We strictly comply with the Anti-Red Tape Act (ARTA), especially the Zero-Contact Policy that only allows government personnel-client contact when its necessary so as to prevent fixers,” Panga-Cruz added. Panga-Cruz also noted that BOSS played a huge role in the city government’s full payment of a P1.6-billion loan incurred by the previous administration. The excess collection during the annual BOSS, together with the collection of the city’s Real Property Tax, was allotted to debt payment. By end of 2018, Taguig is now debt-free. Taguig has received a Blue Certification Award from the Office of the Ombudsman for its streamlined frontline services and an excellent rating from the Civil Service Commission for its compliance with the Anti-Red Tape Act. In December 2018, the City of Taguig received an award for ranking second in the 2017 Bureau of Local Government Finance Collection Target for Business Tax in recognition of its local collection efficiency among the local governments in the National Capital Region. Taguig City, despite being one of the youngest cities in the country, was also recognized last August 2017 by the National Competitiveness Council of the Philippines as one of the Most Improved Local Government Units in the category of Highly Urbanized Cities. The City of Taguig is currently home to top corporations, embassies and government offices. New hotels, educational institutions and shopping malls have also sprung up in recent years within the fast-growing business districts of Bonifacio Global City and ARCA South. In fact, the new Philippine Stock Exchange Tower was unveiled on 5th Avenue corner 28th Street on February 2018. Muli na namang inuilunsad ng Taguig City government ang Business One-Stop Shop (BOSS) program sa lungsod upang makapag-bigay ginhawa sa mga namumuhunang entrepreneurs at business owners sa syudad. Simula January 3 hanggang 20, 2019, ipapatupad na namang muli ang BOSS program na walang weekend breaks, upang sa gayon ay maalalayan ang mga negosyante na abala sa kanilang mga gawain mula Lunes hanggang Linggo. Mabibigyang muli ang mga negosyante ng mabilis at maaliwalas na pag-renew ng kanilang business licenses at registrations sa maayos at iisang lugar. Bukod pa rito, nagkaroon din ang mga business owner ng karagdagang venue para pagdarausan ng BOSS, at ito ay sa Taguig City Hall Auditorium o sa Kalayaan Hall at sa People’s Hall na matatagpuan sa Satellite Office ng SM Aura Tower simula 8 am. hanggang 5 pm. Ang BOSS ay isa lamang paraan upang ipakita sa mga namumuhunan ang kanilang importansya at ang business-friendly ng kultura sa Taguig. At dahil mabilis na ang pag-proseso ng business permits at licenses, ginawa na rin ng Taguig City government na maging memorable at komportable sa mga business representatives dahil meron pa silang libreng candies, biscuits at refreshments sa kanilang pagbisita sa BOSS. Meron ding personalized umbrella at wall clocks ang nagaabang sa unang 100 na pupunta sa BOSS. “Taxes are the lifeblood of the city’s programs and social services,” paliwanag ni Business Permit and Licensing Office officer-in-charge Atty. Fanella Joy Panga-Cruz. Dagdag pa ni Panga-Cruz na ang mga tax na ibiniabayad sa gobyernong lokal ay may katumbas na social services kagaya ng door-to-door delivery ng mga gamot at scholarship assistance, at marami pang iba. “The more taxes we collect from the business community, the more we can provide services to Taguigeños,” saad pa ni Cruz. Dahil sa maayos na serbisyo at pagiging compliant sa Republic Act No. 11032, kilala rin bilang “Ease of Doing Business and Efficient Government Service Delivery Act of 2018,” ang Taguig City ay naka-kolekta ng P2 billion sa pamamagitan lamang ng BOSS program noong 2018. “Transparency plays a vital role in our city’s successful conduct of BOSS. We strictly comply with the Anti-Red Tape Act (ARTA), especially the Zero-Contact Policy that only allows government personnel-client contact when its necessary so as to prevent fixers,” dagdag pa ni Panga-Cruz. Sinabi pa ni Panga-Cruz na ang BOSS program ay malaki ang naging papel sa pagbayad ng lungsod sa utang nito na P1.6-billion loan na inutang pa noon ng nakaraang administration. Ang malaking collection sa taunang BOSS, kasama pa ang collection ng Real Property Tax ng Taguig ay inilaan sap pagbayad ng utang. Bago natapos ang taong 2018 ay debt-free na ang Taguig. Dahil dito, nakakuha ang Taguig ng Blue Certification Award mula sa Office of the Ombudsman dahil sa organisadong frontline services, at ang excellent rating na nakuha mula sa Civil Service Commission dahil sa pagiging compliant sa Anti-Red Tape Act. Noong December 2018, ang lungsod ng Taguig ay nabigyan ng parangal sa pag-rank nito ng second place sa 2017 Bureau of Local Government Finance Collection Target for Business Tax na kumikilala sa local collection efficiency ng bawat local government units sa buong Metro Manila. Ang Taguig City, sa kabila ng pagiging isa sa pinaka-batang syudad sa bansa, ay kinilala noong August 2017 ng National Competitiveness Council of the Philippines bilang Most Improved Local Government Units sa kategoryang Highly Urbanized Cities. Ang City of Taguig din ay kasalukuyang paboritong lugar ng mga top corporations, embassies at government offices. Marami ring bagong hotels, kolehiyo at unibersidad, shopping malls at iba pa ang lumipat na at nagtayo ng kanilang mga branch sa Taguig nitong mga nakalipas na taon. Ang mga paborito ay ang mabilis na pag-unlad ng business districts sa Bonifacio Global City at ARCA South. Maging ang bagong Philippine Stock Exchange Tower ay binuksan na rin sa 5th Avenue kanto ng 28th Street noong nakaraang February 2018.